Any person may wear tartan. Both Scots and non-Scots can wear the "District" and "National" tartans. There are a number of other tartans that might be selected by citizens of other nations as an alternative to any clan or family tartan. The list that follows is by no means complete,but rather is to be used as a guide to selecting an appropriate tartan for personal use. UNITED KINGDOM: "Tyneside", "Devon" "Durham", "Somerset", "Cornish National", "St. Piran", "Ulster Tartan", "Welsh National", or "Manx National". IRELAND: "Tare" or "Murphy", "Clodagh", "Ulster Tartan"
CANADA: The "Canadian Centennial Tartan" serves as a "national" tartan for all Canadians. Each Province and Territory has its own official tartan. The attractive asymmetrical "Maple Leaf" tartan is often seen in ladies' clothing but is not recommended for Scottish dress.This tartan is considered by some to be the true "National Tartan of Canada". UNITED STATES: A number of the states have official or unofficial tartans "Maine", "Carolina", "Georgia", "Ohio", "Idaho", "Washington", "Texas Blue Bonnet","Kentucky" and "Pennsylvania". One city, "Tulsa", has adopted a tartan. 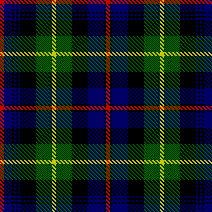 There is a little-known tartan designed for all citizens of the United States, the "America", and several setts associated with military organizations and universities: "West Point, "The Citadel", "Leatherneck". New tartans are being added each year. SOUTH AMERICANS might consider wearing the "Cochrane" tartan in honour of the naval hero who founded the navies of several nations and led them in the wars of independence (Brazil, Argentina, Chile). SPAIN: Spaniards with Celtic roots can choose the "Galicia" tartan. Others might select the "Wellington" in honour of the Duke who directed the joint British-Spanish liberation of the nation from Napoleon. PORTUGAL: The Duke of Wellington was commander-in-chief of the Portuguese Army in its struggle to free the nation from the French. The "Wellington" tartan is a good choice. FRANCE: The French supported the Jacobite cause and the Jacobite tartan is appropriate. French soldiers died at Culloden and the "Culloden" tartan honours them. AUSTRIA: Austrians could choose the "Leslie" tartan in honour of the Scottish expatriate soldier who rose to general rank in the Hapsburg army. GERMANY: Germans remember that Prince Albert, lover of the Highlands and tartan designer, was a German. The "Coburg" tartan was designed in his honour and is a good choice. NETHERLANDS: There is a registered "Dutch" tartan which represents the Netherlands, honoring both the House of Orange and members of the "Mac Kay" family who have been prominent citizens of both nations. RUSSIA: Russians might choose the "Muskova" tartan or the "Gordon" in honour of the Scottish general who modernized the army of Peter the Great -- and who was killed leading it against the Swedes. SCANDINAVIA: The "Mackay" or "Munro" tartans are appropriate in remembrance of the thousands of Scots led by these clans into service in the armies of Sweden and Denmark in the seventeenth and eighteenth centuries. ITALY: The "Prince Charles Edward Stuart" tartan is appropriate for "Bonnie Prince Charley" was born and died a resident of Italy.